There are only 3 CDI drugs in wider clinical use: vancomycin, metronidazole, and fidaxomicin. They are from totally different classes and have almost nothing in common except for proven efficacy in C. difficile infection (CDI). Like vancomycin, the entire group of glycopeptide drugs seems to have good activity against C. difficile. Based on microbiology and animal data they could all be used interchangeably if need be. Differences exist but are probably not clinically relevant. For instance, telavancin MICs are lower than for vancomycin but with a similar MoA it is hard to see any differentiation that would justify a separate CDI development for this or any of the other old glycopeptides. Fidoxamicin has moved the goal post regarding efficacy. It is a macrocyclic antibiotic and as active as vancomycin or metronidazole. In addition, it has some unexpected features, both good and not so good: it reduces relapse rates in half in first-time responders, but not so for patients infected with the BI/NAP1/027 hypervirulent strain. No doubt, there is room for improvement on several fronts. Besides the key features of efficacy and safety, the next CDI drug should have a very low relapse rate (< 12%) and only minimally affect the gut microbiome. These two goals are interconnected: it stands to reason that less disruption of the gut flora will also protect from relapse. This can only be avoided with a more C. difficile – specific agent. Likewise, sustained clinical response in patients infected with the hypervirulent BI/NAP1/027 serotype would seem of great importance. Taken together, this makes the target profile for the next CDI drug multi-dimensional. 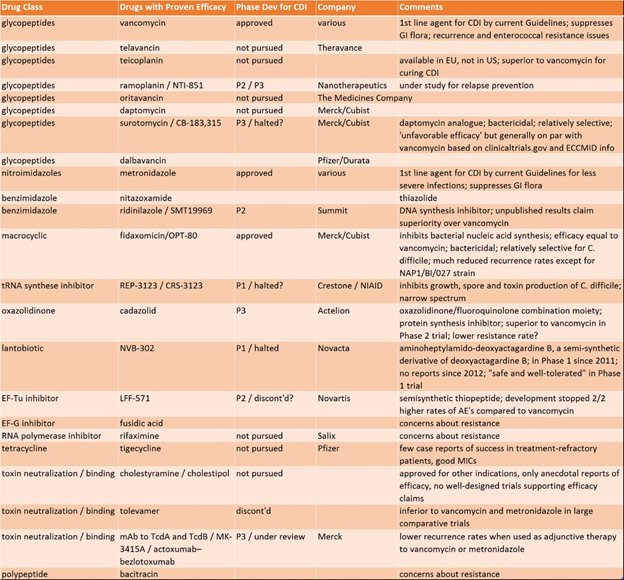 Industry consolidation may affect development efforts of CDI drugs as well. It is hard to see how Merck – after acquiring Cubist – would continue work on all the CDI drugs it now has in its portfolio. Fidaxomicin was priced so high it self-destructed in the market; it may now be too late to turn things around. Then there is the anti-toxin cocktail of 2 monoclonal antibodies directed at clostridial toxins TcdA and TcdB which is ‘under consideration’ for development. In a sizeable (N=200) Phase 2 study, the monoclonals improved C. difficile recurrence rates significantly and by a healthy margin when used in combination with either vancomycin or metronidazole. Clinicaltrials.gov lists a Phase 3 study as completed since November 2015; hence, it is time for a publication, one would think. Antitoxin therapy is highly effective in the other 2 clostridial diseases, tetanus and gas gangrene, hence, there is indirect proof of concept. However, tolevamer, an orally administered toxin binder did not fare well in Phase 3 testing (despite promising Phase 2 results). Surotomycin (CB-183,315 or MK-4261) is not listed on the Merck list of drug development candidates, for unclear reasons. This daptomycin derivative should not be discarded too quickly. It is structurally quite different from vancomycin, oritavancin, telavancin and dalbavancin. It remains to be seen whether the Cubist team – now at Merck – is able to get such finer points across to their new management. The poster of a large Phase 3 surotomycin study was presented at ECCMID 2016 / Amsterdam. The drug showed essentially equivalent efficacy to vancomycin. Unfortunately, the primary efficacy endpoint narrowly missed the 10% non-inferiority delta; the 95% confidence interval boundaries were [-11, 1.9]. This entry was posted in Recent Literature, The News, The Viewpoint and tagged Actelion, actoxumab, Allphase Pharma Consulting, antibiotic blog, antitoxin, bacitracin, bezlotoxumab, BI/NAP1/027, Cadazolid, CB-183315, CDI, Clostridium difficile, Crestone, Cubicin, dalbavancin, Dalvance, daptomycin, Dificid, Durata, ECCMID, EF-G, EF-Tu, Enterococcus faecium, fidaxomicin, Fusidic Acid, gas gangrene, glycopeptide, glycopeptide antibiotics, Harald Reinhart, LFF-571, Merck, metronidazole, MK-3415A, MK-4261, Nanotherapeutics, NIAID, nitazoxamide, Novacta, Novartis, NVB-302, OPT-80, Orbactiv, oritavancin, Pfizer, ramoplanin, ridinilazole, rifaximin, Salix, SMT19969, Summit, Surotomycin, teicoplanin, telavancin, tetanus, tetracycline, The Medicines Company, tolevamer, Tygacil, Vancocin, vancomycin, Vibativ, VRE, Wyeth by Harald. Bookmark the permalink.